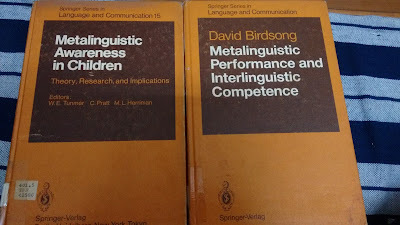 This past month I have been working on my Masters' dissertation in psycholinguistics. The project is not what this post is about, but something I stumbled upon during my research. My subjects were 13-14 year old students from my hometown. In a questionnaire about their language profile, I cheekily inserted a question that had little to do with my study - how important it is to be proficient in your mother tongue (here, Marathi) versus English. An overwhelming percentage of the tiny minds asserted that the importance of English proficiency far exceeds that of Marathi. Bilinguality has always been of interest to me, as someone oddly comfortable in her second language. And yet, it disappoints me to see children parroting an uninformed English-bias, greatly influenced no doubt by their own language teachers, who really should know better. I am not here to argue against the presence of English in our schooling, but against the pervasive ignorance of language policy and linguistic theory in mainstream primary education. This post is about how we got here, and why we must leave. Since Akbar's times, Persian was the official language of India. It was during the British rule, obviously, that English took over. In the English Education Act of 1835, T.B. Macaulay emphasized the need for a class of people who were "Indian in blood and colour, but English in tastes, in opinions, in morals and in intellect." (The last bit is particularly tickling.) This is really how English entered Indian primary education, although it would be wrong to say none of our reformers supported Anglicizing our education. Post-independence, one of the biggest debates was (still is) the matter of selecting a National Language. Gandhi was in great support of Hindustani, a sort of combo of Hindi and Urdu. South India rejected Hindi as the national language, not surprising considering how little resemblance their Dravidian languages bear to this language of the North. In 1949, a compromise was struck, and both English and Hindi became the 'official languages of the Union' (Part 17th of the Constitution) with no mention of a national language as such. The intention was to eventually push English out entirely, but hey, we never got there. Much violence and protests resulted in the trilingual education policy or three-language-formula - schools must teach Hindi, English and the regional mother tongue. (Even this was contested in parts of South India, but let's not go there.) The point is this, in a country divided into separate states based on linguistic choices, no region seemed ready to allow official status to the language of another speaker over his own. English belonged to no one and hence, irony, to everyone. It stayed as the lingua franca. In our post-colonial society, English was the language of the elite - an influential class. Today, our mass adoption of English gives our country one of its biggest economic advantages. Such valorisation is difficult to erase, but why should we? If anyone can pull off multilingualism, it's India. So, political reasons out of the individual control is why English is here to stay. And it is not a bad thing, I am happy that today, sitting all the way here in India, I can talk to the globe with a command on English that only my very early exposure in school could have given me. But, lately, I have seen far too many parents converse in English with their children. Preachy teachers with fake British accents (or not) encourage it. Infuriating. You see, in India, the aforementioned trilingual education policy makes it impossible not to raise kids as multilinguals. In such a situation, trying to block out the mother tongue to replace it with English is, at best, misguided. The bilingual brain functions differently from the monolingual brain. It contains in itself more than the sum of two languages, which is why we can speak in mixtures of English and our own language. Linguist Vivian Cook calls this multicompetence. In fact, with every new language you learn, the structure or "shape" of the brain changes. How beautiful is that! According to Jim Cummins, a Canadian expert in second language education, the two languages in a bilingual brain interact and overlap, such that certain basic cognitive skills and concepts can transfer from one language to the other. Lots of exposure to the second language, plus overt instruction in the first language is enough to develop proficiency in the second language. Teaching in this manner increases the child's comfort, and hence competence. Any child better learns new things while cocooned in old familiar things. In India, we enter school at the age of 4, our brains fully equipped with the mother tongue. Not to use this as a resource in learning English is silly, but to actively encourage wiping it out is dangerous. Banning the use of the first language, Cook says, will not stop learners from using it. The brain can't separate two languages just because some random teacher wants it to. What banning the mother tongue will do is make tiny gullible minds guilty of using it to help think, it will demoralize those who realize they need their mother tongue to better understand and learn. Banning the first language in a second language classroom takes away an effective learning strategy. It becomes harder to learn English without using the mother tongue. And we don't want that, do we! Banishing the mother tongue from a child's home is attempting to exchange a potentially restructured cool bilingual brain for a simple monolingual one. Neither scenario is very positive. And, really! I wish more people understood this. More than anything, I wish we had more language teachers with a fair grasp of linguistic theory and an interest in it. It is easy to underestimate something like language, something everyone can "do," but its widespread application is the very reason it is so essential to get it right. In that diverse set of some 60 students I spoke to during my data-collection spree, one little girl stood out. All long braids and twinkly eyes. Both the languages are very important, she told me emphatically, each in its own way. I told her to hold on to that thought.